Transmission of etiologic agents by arthropods is a complex phenomenon, and generalizations are difficult to make. 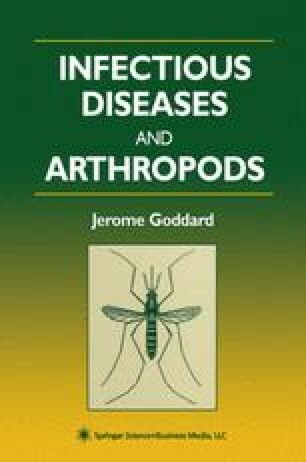 Just because an arthropod feeds on a diseased host does not ensure that it can become infected, nor does it ensure (even if disease agents are ingested) that ingested pathogens can survive and develop. There is considerable misunderstanding about this. When bitten by a tick, people think of Lyme disease (or something similar), often insisting that their physician prescribe an antibiotic prophylactically. Little do they realize that there are many tick species and not all are capable of disease transmission (1). Further, they fail to realize that not every tick in nature (even within a vector species) can be infected. Depending on the disease and area of the country, the presence of an infected tick can be like a needle in a haystack.